Anyway You Slice It, Be Prepared! One of the keys to success in any body transformation is your nutrition. Yes, exercise is important too, but unless you harness healthy changes to what you eat, you can be left spinning your wheels! Today I want to talk to you about preparation. That’s right, setting yourself up for success in the kitchen. In this ever-increasing fast paced life we all live in, we seem to be faced with more things to do and less time to do them. Now do you think it’s any surprise that this also leads to an increasing waist line of Australians? Last ABS Census revealed that 60% of Australians are considered either overweight or obese! That’s incredibly alarming. On a daily basis I meet with people who struggle to eat well-balanced, healthy and nutritious food on a consistent basis. Often the problem is that most people just don’t know where to start and what to do. My work and family schedule with my two daughters is incredibly hectic. I have early morning starts, late night finishes, multiple client appointments 6 days per week, enjoy being a father in between, and still prepare healthy meals!! The key to my success comes down to the preparation work I do over the weekend, which makes meal preparation during the week absolutely effortless! Let me tell you some of my secrets. I eat a lot of fresh fruit and vegetables, but I hate cutting them up for each meal. So my trick is cutting all my veggies up in bulk. When I am ready to cook with them it’s a case of taking them out of the storage containers, washing them, and they’re ready to go. A task that would previously take minutes, now takes just seconds. Now for my next trick! The thought of cutting up all those veggies can seem a bit tiresome, but I use a couple of really handy products. Without sounding like a TV commercial, I do really enjoy using my Nicer Dicer. 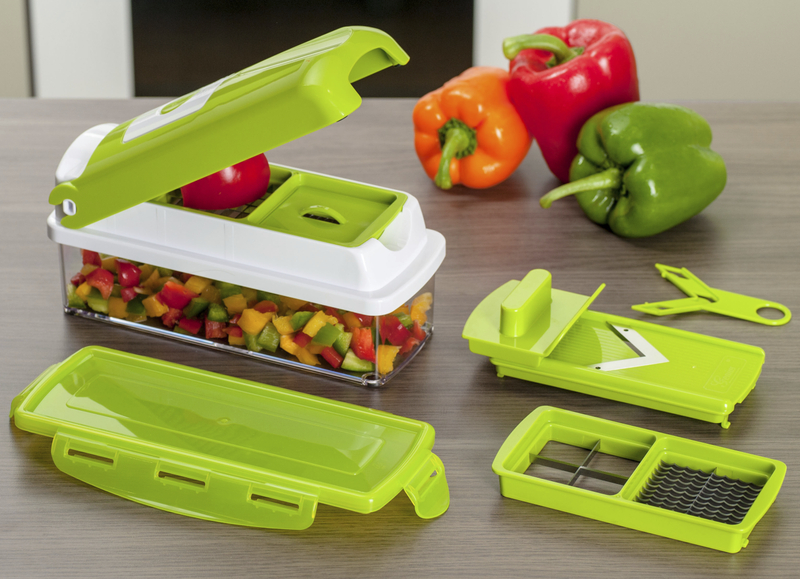 It cuts up the veggies in no time at all in a number of different shapes and sizes. My other must have kitchen item is the V Slicer. It’s an oldie, but a goodie! I use the V Slicer to cut up carrots, zucchini and cabbage to make my own coleslaw. They’re very economical to buy and make light work of the process of cutting up your veggies and fruit. 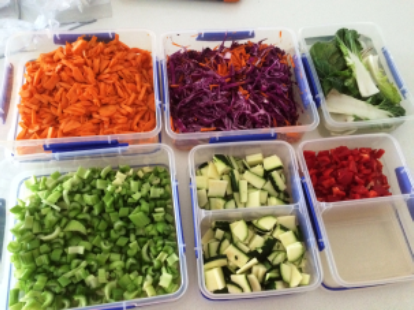 Now the veggies are all cut up and awaiting their use, it’s probably a good time to point out that you will need to use them all within about 4 days if you want them to retain their full nutritional value. My approach is to cook a number of different dishes from Friday through to Sunday night. I might cook up a couple of stirfrys or slow-cooker recipes that make at least 6 to 8 meals each. I then portion those meals out in containers, weigh them to make sure they’re all approximately the same weights, and pop them in the freezer. 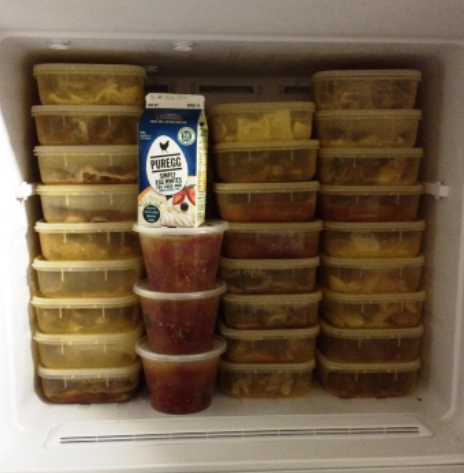 At any point in time I’ve usually got about 20 meals ready to go in my freezer. All prepared by me, healthy, nutritious and ready to eat within 6 minutes. That’s how I make my food work in a very busy life! We’re all human. If I didn’t do this preparation then I would probably skip meals or go for an alternative that was less than nutritiously optimal. Being successful takes effort. Consistent effort. But by using these couple of tips I’ve given you here, you can see how you can take your hectic life and make it a breeze through the week if you take some time and focus on the weekend to prepare in advance. It’s not hard, afterall, if I can do it, YOU can too! If you’d like us to create an individually tailored meal plan using delicious recipes that freeze really well and help you get to your fitness goals sooner, then give us a call on 0421 287 107 or email us at StudiozPT@gmail.com. Prices for our meal plans and 30 days of online coaching start at just $139.